Male-to-female transgender Joelle Ruby Ryan, a.k.a. Joseph Nolan Ryan, invoked his right as a male to frame the issues and direct the dialog, successfully lobbying to get feminist speech, and speech deemed “offensive” (meaning, offensive to him, or tending to undermine males as a sexual class) silenced. 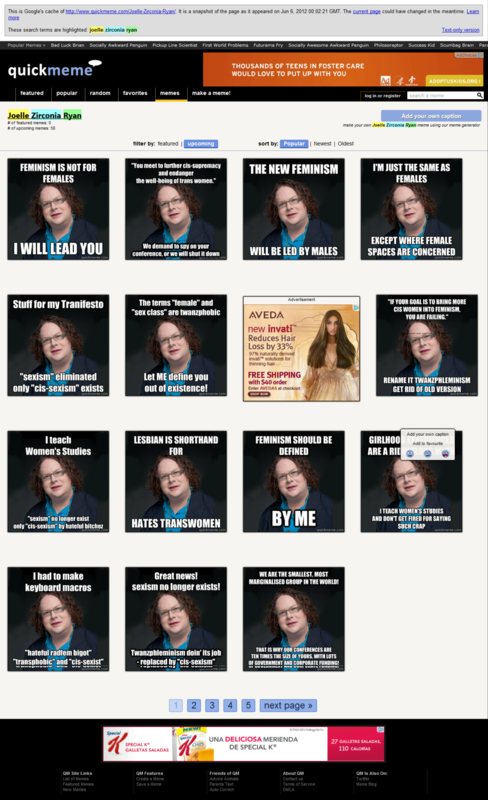 In this case, Quickmeme.com has apparently acquiesced to his demands and removed the previous, rather substantial collection of “Joelle Zirconia Ryan” (LOL) memes from its database, presumably after Ryan invoked the misogynistic, patriarchal legal system to defend his “right” not to be criticized and humiliated by women — we are thinking he threatened to sue. Now that’s good male privilege. As of this publication, two new memes have been uploaded in protest, and in continuation of the political dialog — which is legally protected political speech. In your eye, sir. ETA: Also, the first meme has a typo. We know. 🙂 It was published in the condition in which it was found on the meme generator, as the captionator function was not working, probably because the template was in the process of being removed by Quickmeme, as they stumbled all over themselves trying to placate Big Joe and the demands of his enormous ego. Interestingly, the errant meme is still better on every level — and more coherent — than anything Joelle Ruby Ryan will ever do, typographical error notwithstanding. — Eds.